Hexagon Scarlet Slub Canvas. Playful hexagon pattern provides a vibrant example of the Chinoiserie style. Each individual hexagon contains a textured appearance that sweetly complements the thick off-white border. The pronounced combination creates a delicate linen appearance that will shine in a variety of places. 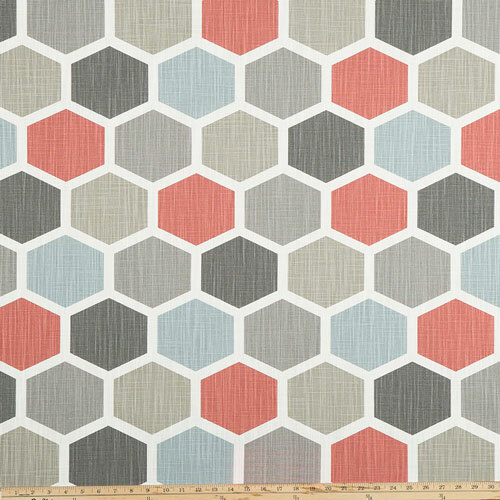 Due to this, the Hexagon Scarlet Slub Canvas fabric unquestionably rivals plain white fabric. Utilize this fabric design to enhance the style of your bedroom or highlight the appearance of any window. Trendsetters will enjoy using this medium weight fabric to create lovely wall decor. Colors include taupe, shades of gray and burnt orange. Medium weight fabric suitable for drapery, decorative pillow covers, headboards, handbags or light upholstery.